Given Western North Carolina’s rich and varied history, there are plenty of aging and abandoned places that are ripe for rifling. From nineteenth century mills to squeaky old school halls, Kimberly Bartel has snapped hundreds of gritty shots of forgotten and crumbling spaces around the region. 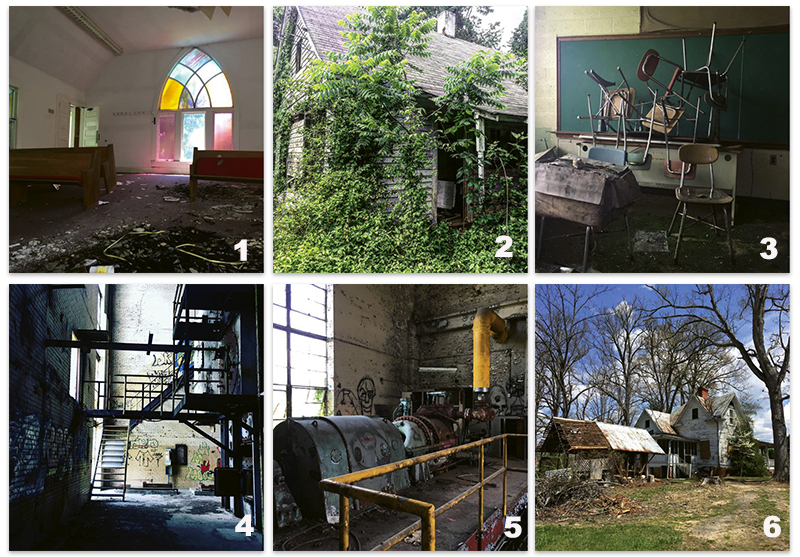 The haunting photos make their way to her Instagram account, AbandonedWNC, where they rack up likes by fellow urban explorers and curious scrollers alike. Exploring is in Bartel’s blood: Her parents are both archaeologists. An interest in photography of forsaken places led her to seek them out herself. “There were two abandoned homes down the street from my work, so I drove down there on my lunch break to see what it was like,” she says of her first exploration. Since beginning her hobby about a year ago, she’s broadened her scope from the Asheville area to Appalachia at large, from farm homes to more expansive properties, like hospitals and prisons, thanks in part to tips from her followers. Everyday objects, left to the elements, serve as puzzle pieces scattered across dusty floors. Thanks to Bartel’s delicate approach, the puzzles will stay intact for others who follow. “I am part of a group of urban explorers,” she says, “that try not to disturb the environment or take anything.” Her only souvenirs are digital: the photos she shares on Instagram and videos for her YouTube channel, Kitschy Travels. Though Bartel doesn’t have any plans to quit her day job (she’s a social worker), she does dream of curating a picture book of deserted but notable locales—before they are gone forever.